Commando! Fight against the Brutal force in this( FPS) a game ofshooter war. Play the best first person shooting game (FPS) forfree. Enemy has started out frontline commando shooting mission.Your army base camp is under terrorist attack. shoot and kill themilitants near the boarderline. As an elite commando your duty inthis Game of War is to destroy the battalion of SSG commandos. As a frontier commando be a good strategic war planer.ThisShooting War is one of the best Frontline Commando Games. yourmission is fight against the dangerous soldiers which invading thearmy base. - Trap the movement of enemy in night vision mode. Welcome marksman agent #23 in this counterattack first person shooting game in prison yard. 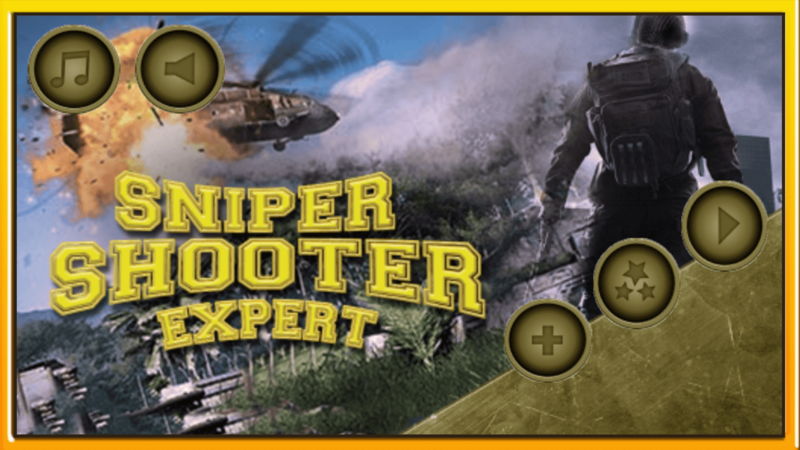 Be an Elitesniper and complete all sniper duty missions with ultimateperfection. it’s a hard time for you as a marksman agent. 3D GamezPickle presents you the Prison Escape: Jail Yard Break Sniper 2016game.Due to a mistake of jail warden prison break the jail. Your dutyas an Elite sniper is to terminate these threatening escapingprisoners before they escape from prison yard. Keep following thecommands and terminate the escaping prisoners one by one in stealthmode as an Elite sniper. You have to complete different sniper dutymissions in different stealth locations like on the rooftop, stairsand roof corners. There are many levels to terminate the prisonersin jail yard, hold the criminals in prison zone until reinforcementreached in jail and Earn the scores to get yourself top listed inmarksman agent list as you are agent #23. They are murderers anddangerous criminals and can attack the city after jail break.This is a first person counter attack sniper 2016 game. As youknow it’s a hard time for you but you have to accomplish all snipermissions in prison yard. You must follow the commands otherwise allcriminals will be succeeded in prison break.HOW TO PLAY:- Select your sniper mission and start the counter attack battle assniper duty- You can’t change your location as it’s a stealth snipping missionin prison yard- Pinch in and Pinch out to Zoom the Sniper’s View- Target criminals and Press Fire Button- Press Hour Glass button for Slow Motion- You can fire 3 bullets like a advanced assault rifle sniper- If you take the headshot you can get more point- Long distance shot can reward you more points- More points can take you to the top of list in Marksman agentlist- You have to follow the commands and complete the hard mission incommanded timeFEATURES:- HD and real life like Prison Yard environment- Easy to play controls.- 25 awesome Elite sniper missions with complete story line andcommands- Full Action packed music and sound effects- Outstanding gameplay experience with Slow motion kill cam- Free and best Action Shooting Game 2016- No Wi-Fi required, Can be played without Internet connectionJOIN US ON SOCIAL NETWORKS:- 3D Gamez Pickle Website: http://kavtechsolutions.com- Join our Facebook Page: https://www.facebook.com/KavTechSolutions- 3D Gamez Pickle on Twitter: @KavtechsolutionVisit this link for more Action, Shooter and SimulationGamehttps://play.google.com/store/apps/developer?id=3D+Gamez+PickleWE LOVE TO HEAR:* If you like this First Person Shooting Sniper 2016 Duty Game,then Rate and Review and if something went wicked or you have anyrecommendation then please give your valued feedback atmailto:[email protected] MESSAGE FOR CUSTOMERS: :* This is free game specially for teen and Action lovers. Itcontains third party ads and In-App Purchases that can be purchasedby real money if you don’t want to spend money then restrict it onyour device. 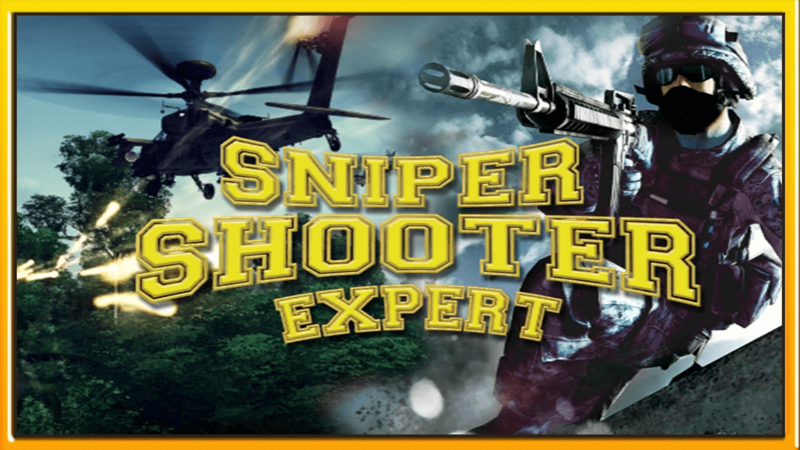 SWAT sniper triggerSimulator of sniper 3d shooterYou swat sniperassassin of elite army sniper!Your target crime gangster, sniperkiller, commandos!Get prepared for everything , an online fps gameevery time or wherever you can play it at no cost . I use greatgraphics and Best sounds in map.Rescue your soldier from dark city, shoot enemy guards and reach nearest top buildings for saferescue by friendly soldiers. Now its time to rescue remainingsoldier and start counter strike and show fighting skills.To assistyou as our last hope we want to help you in safe rescue , picksniper for long range shooting, pick shot gun for short distanceand for heavy damage, pick most famous AK47 to deadly assaultmissions. 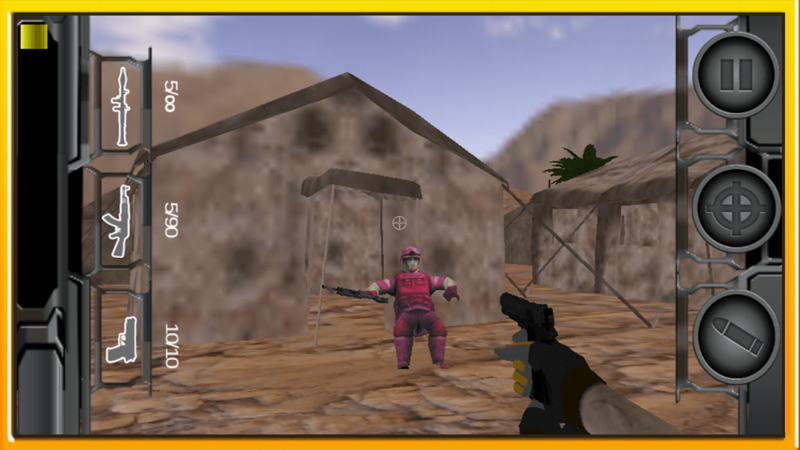 Sniper Civilian Rescue is a first person shooting game withthrilling game play, smooth controls and very interesting story.You are an Army commando from special services group who has beenassigned a duty of rescuing hostage from terrorists and clean themup. The area of your job is densely populated so you have to facemaximum resistance. Its a real skill test of commando in suchsituation. Hostage are under real threat from terrorists. You haveto rescue civilians from ten different places each one is harderand challenging then the previous. Good thing is you have unlimitedammunition and health bags with you so take position aim your bestsniper gun and shot these dangerous terrorists. In first fivemissions terrorists are unaware of your presence, shoot all enemiesand help civilians to reach helicopter. Last five levels are verychallenging as enemy is aware of your presence.How to Play:☀ Dragfinger on screen to look enemies.☀ Tap Fire button on right bottomto shoot.☀ Use Telescope of your sniper to view far distanceenemies.☀ Use Radar to detect enemies.Game Features:☀ 10 level gameplay.☀ First person shooting game.☀ Easy to use control and smoothanimations.☀ Best Sniper gun with telescope.☀ Real war time rescuechallenge.☀ Health bags to increase your life.☀ Helicopter forhostage rescue. *** Attack AT ENEMY BASE CAMP In The Middle Of Sahara Desert*** Ata hot and arid desert, in a singing atmosphere with wind and sandgrains blowing, Are you ready to Infiltrate at enemy base camp!Prepare for a Daring ultimatum with full of Cartel and horror.Takeyour carriage, Load armament, Align your handgun and assault atrivals.An amazing game play is available at Play store now, Trythis completely 3D everlasting and non-stop war task and leave yourkind and honored suggestions and reviews. *** YOU ARE Head OFRegiment *** You are about to enter a gigantic enemy frontier lineon a flat plain, where only right strategy and mind plan will saveyou. You are Legend of your troop... Yeah sure! You have to leadyour battalion to definitely successive end at this dusty and sandyland. Prove yourself Daring tribune for your armed force and defeatthe enemy. ****MULTIPLE MISSIONS**** You are appoint with differentmissions at each stage to destroy enemies objectives and to preventenemy occupy strategic positions in the area. So knack yourstrategy according to each mission. And get ready to enjoy thistrajectory physics simulation. ***STORY LINE*** A big daringmission is in front of you.Bombard at Enemy Command post with yourdeadly sniper rifle. Enjoy awesome fully 3D sniper Desert action. Apowerful furious Rifle with unlimited armament is provided to you.Retain with Radar navigation to find and locate enemies on thisbarren land. Shield your health and live long to fall of therivals. Game has three stunning waves to enroot the enemy garrison.Align gun scope and shoot confidently.History of the most popularsniper game "Sniper Desert Action" has landed google playplatform,which has exquisite game screen,tough operation,full ofpassion,let you can't stop shooting games.here you will become oneof the worlds best snipist.You need a cool head anomaly analysisand fast,aggressive,accurate shooting.Quickly pick up the weapon inyour hand,make your blood boil.do not let the terrible criminalsout of your sight,do not hesitate to experience theexcitement ofthe game and passionate sniper thrill it. ***Characteristics*** *Beautiful 3D graphics of desert terrain. * The natural sounds offire and game music. * Best rifle and sniper gun for accurateshooting. * Use swipe controls to aim. * Use fire button to hit theenemies. * Addictive, loving & full of fun. * Superb desertmountain with amazing action pack animation. * Realistic simulationwith very engaging background music to enhance your gameplay. * Usethe telescope to aim the enemy at far distances. * Realistic visualeffects and the world's best battle music. * Great graphics andenvironment. * Different Levels with new Mission and new HDenvironments. * Tank Rocket weapon fire & Guided Drone Missileattack. * Enemy Tanks and Heavy Guns fighting against you withArtificial Intelligence (AI). * Support for HD phone devices andtablets. * Military themed quality Army User Interface (UI). ***GETREADY TO TAKE REWARD*** There are only one mission which has threewaves in Desert Battle Shot. Each waves comes with differentdifficulty level and different targets. There vehicles will bemoving during the game with the soldiers equipped with weaponrythat are your target too. After you complete the mission, you willbe awarded great reward from your senior commanders. We hope youwill enjoy this game till your battery finish out. Alwaysappreciate your reviews and suggestions. Thanks for downloading . .
You are the only one left in your team, they killed all of ourteammates. You have to avenge for their lives and for the lives tocome. You are the only hope against these imbeciles who took livesof innocent people. The environment of war really is very hostileand you should be careful not to end up being surprised by anyenemy soldier, ready to shoot at anything that moves or makessound. Mountain base sniper shooting is located in jungle in themountains, and it is about skill, aim and accuracy. This shootinggame simulates the real 3D environment a mountain sniper has toface. The rocky terrain and storm weather is perfect for scout.Your mission is to simply clear the base camp from enemies byshooting them with your sniper rifle. All the skill you havelearned in the training missions must be used here. The intensivewar zone will give you no time to wait and think, just aim and takethe shot with the powerful weapon rifle and kill the target. Stormthe advanced sniper course while challenging yourself to kill theenemy with headshot and at the same time preserving your ammo. Youare far from any population or city so you have to reserve yoursources and destroy the evil within the forest. People say: lion isthe king of the forest but in here you are, and you have to proveit by clearing the vicinity and walk through different levelskilling each and every single enemy. The 3d mountain may lookpromising but you have to help the people by destroy theseterrorists or else it will be too late for humanity. The things youlearned in sniper club were just the training, this is real life,you are paying with your life so you must act agile and cautiousall the time. The enemy will not shoot you until you shoot him,which will make them aware of your presence. Try to kill as many oftheir army men as you can with the powerful sniper. Enemies aretrained and focused on one thing that is killing, you must takeactions one step ahead of them in order to make their plans fail.The jungle is not a safe place, you must look out for bikes andenemies slithering towards you. This 3d simulation game helps youstrengthen your reflexes as well as passes your time as you enjoythis 3d shooting and sniping game. 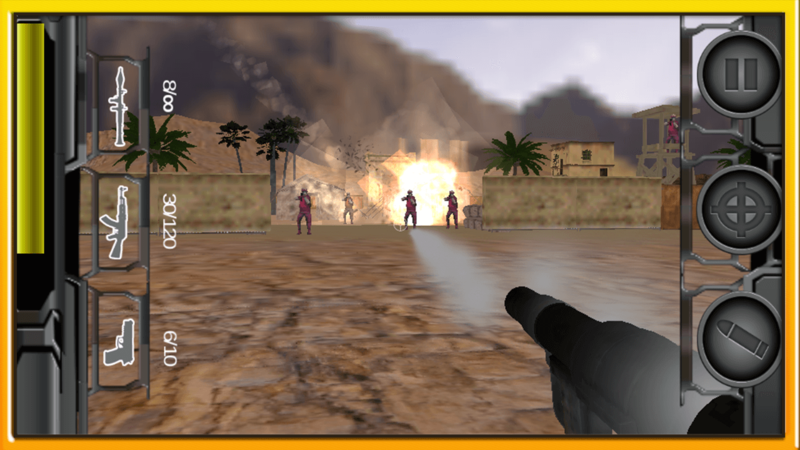 Fire away all the enemies in thefps (first person shooter) and 3PS (third person shooter)challenging game. Show the action to the world by making high scorewhile going through extreme killing adventure. Combat withterrorists on the battlefield and counter their strikes in commandomilitary action. Don’t let enemies take frontline convoys, sobecome brave and fight like an elite assassin trained by specialfury force. Fight for the freedom of the innocent people and huntdown enemies who are hunting you. When you are done with yourmission you can start another one anytime you like, as there aremany enemies to kill and many combats to fight. This is a Bravocollection in free android games that you must try and tell yourfriends. Features: - HD graphics - Realistic sound effects. -Realistic animations - Beautiful view of 3d mountains. - AddictingFirst Person Shooter (FPS) gameplay . - Easy to use and control. -Hundreds of thrilling Missions. - The guns are reloadedautomatically. - Zoom in to kill the enemy and then zoom out. - Aimfor head shot to preserve ammo and accurate. 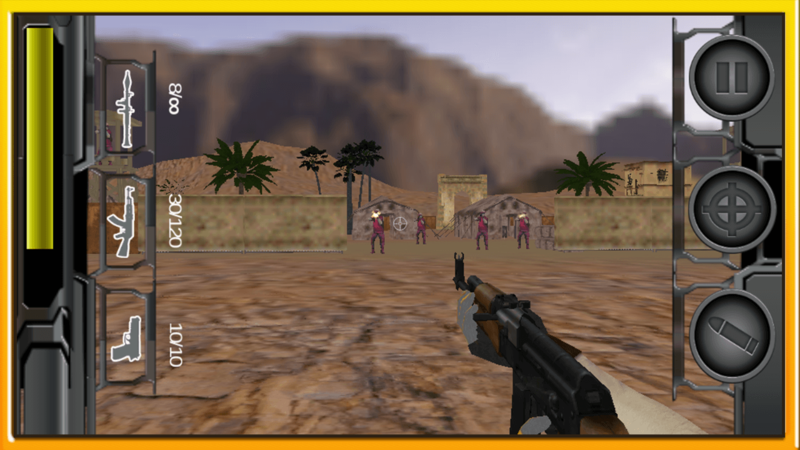 - Realistic 3d hillsite environment Game Play: - Touch & move the screen to aimthe enemy. - The enemy will not attack you until you fire yourfirst shot. 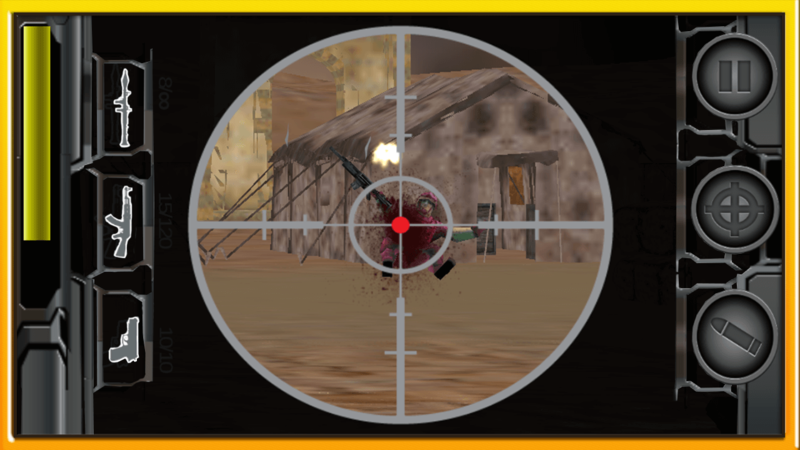 - Use the scope sniper to aim the enemy from fardistance. - Use fire button to shoot. Note:We are continuouslyworking to make all Android phones and tablets run this gamesmoothly. Your ratings and reviews are our helping hand in makingthe game enhanced. This free game is supported by Ads as per GooglePolicy.